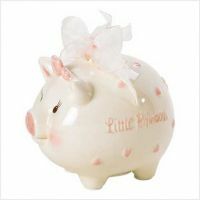 The Mud Pie Princess Piggy Bank isa classic coin bank crowned with a bow. Painted with pink hearts, this grinning pig makes a beautiful gift for your little princess as she begins saving up for a rainy day. Perfect for a bedroom or nursery.